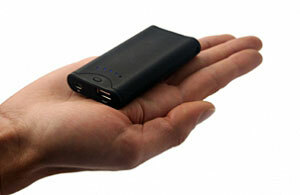 Proporta USB Micro Mobile Device Charger reviewed - portable battery pack for phones, MP3 players, cameras etc. We were mightily impressed with Proporta's Mobile Survival Kit USB Emergency Charger when we reviewed it earlier this year, so we were keen to check out their new, shrunk down Micro version. The Micro Mobile Device Charger is substantially smaller than the original version, measuring 88 x 50 x 14.5mm compared to 100 x 62 x 15mm, making it small enough to slip in a shirt pocket (or just leave in a handbag). Essentially a big rechargeable battery, the Mini comes with two ports; a full sized USB port for charging the battery directly from a PC or notebook, and a mini-USB port for hooking it up to the portable device that needs charging. An extremely bright array of five blue LED lights indicates how much charge is left in the battery pack and animate during the charging process. Once the battery is fully charged, all five lights are lit and the power switch can be turned off to save battery drain when not in use. Much as we like glowing blue lights, we have to say these are a bit on the Bobby Dazzler side for our liking, although we liked the rubbery external finish. The battery pack can store to 1700mAh of power - half of the capacity of its bigger brother but still enough to keep phones and MP3 players rocking a fair while. 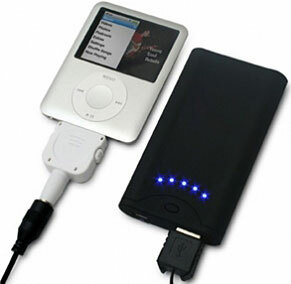 We found it had enough oomph to fully recharge our Palm Centro phone and MP3 player overnight. The Mini bundles a retractable lead and a variety of attachments for attaching a range of popular gadgets (including Nokia, Micro USB, PSP, Sony Ericsson, Samsung and iPod) with further adapters available on their website. The package also comes with a little black travel bag for the charger - a nice touch. Although this unit can't replace a dedicated charger for long trips away, it's the perfect travel companion for weekends away where you might have several devices in need of a power up. How much juice you get out of the battery will depend on the power usage of your devices, but it should be good enough to fully recharge most phones at least once - and that could prove a life saver. Comes complete with a USB to Mini USB cable and retractable cable with adaptors for Nokia, Micro USB powered device, PSP, Samsung, iPod or Sony Ericsson. Measures 88 x 50 x 14.5mm. 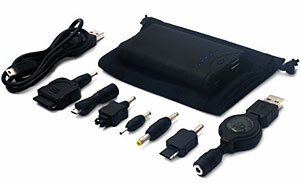 Packs 1700mAh of power (allowing up to 2.5 charges when fully charged). Available in lack with LED light power indicator.